When you’re driving along – whether it’s on your bike or motorcycle or in your car, a flat tire can lead to accidents and serious damage to the vehicle. Unfortunately, you don’t always notice the flat until it’s already done some harm. 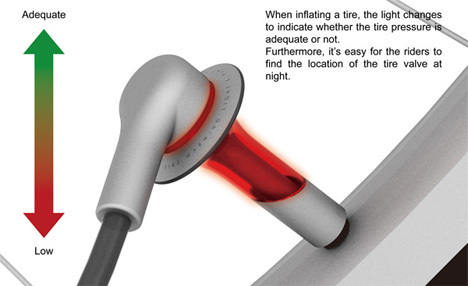 The Flat Tire Warning Light is a concept from Hsiang-Han Hsu, Tzu-I Wen, Jhih-Jie Wang and Yih-Wenn Luo that would give you an early warning before your tire goes flat. 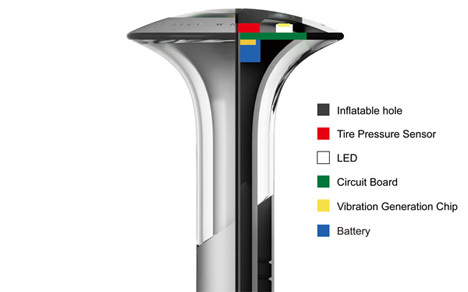 The device is like a little plug that fits into the tire’s air valve. 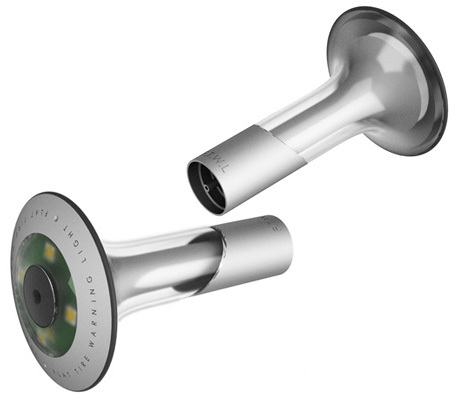 It uses a vibration generation chip to harness energy from the rotation of the tire itself to power the LED on its end. The LED gives you a clear picture of what’s going on with your tire: green means everything is good, red means tire pressure is low, and flashing red means you have a flat tire. While it seems that the device would do the most good on a bicycle where it’s easy to see the tires as you’re piloting it, it could also take the place of a traditional tire pressure gauge when you’re filling up your car or motorcycle’s tires. 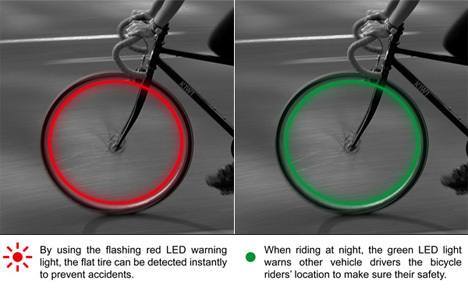 The light changes from red to green as the tire pressure goes from low to adequate. In addition to alerting you to signs of tire trouble, the Flat Tire Warning Light lets other people on the road know that you’re there. Again, this is most helpful when you’re on a bicycle, but it could also help drivers find their tire valve when they have to stop for air in the dark.